The Covered Life: You are known! Just read the words above again, even if you already have and let them seep into your heart and soul. This was my verse for quiet time this morning and oh how happy it made me. So much so, that I decided to share it with you. There are several nuggets of goodness or treasures for us in these verses. The first is that God is in our midst, or God is with us. He hasn't forgotten us or forsaken us, He is with us. We know that Christ came to earth, 100% God and 100% man. We can't begin to understand that, and we aren't meant to. But by faith we believe. And if we are Christians, we know that Christ died for our sins, and he rose again. 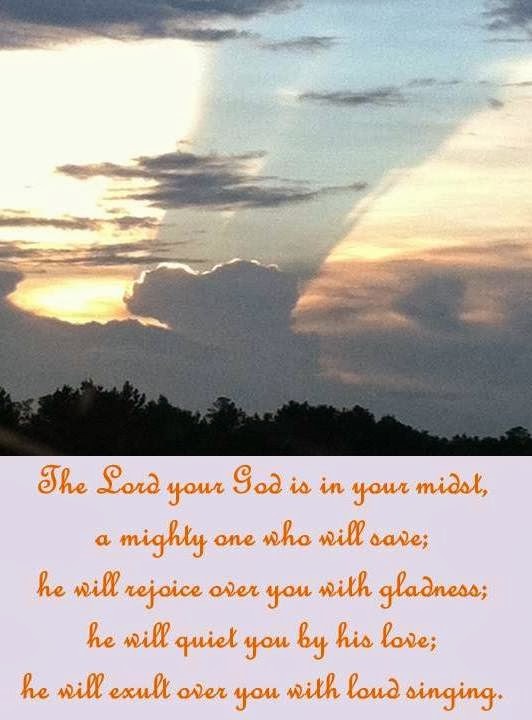 And this verse is referencing him when it says, God is in our midst, "a mighty one who will save." When we come to a saving knowledge of Jesus Christ, God rejoices over us! The God of the universe is rejoicing over little ol' me? YES! We are important. We have worth. God loves us. The next treasure in this verse is that God will quiet us by his love. This doesn't mean that God loves us so he smites us, or makes us mute. No, what it means is that God quiets our fears. He calms us by loving us. There is no need to worry or stress, because God's love sustains us. Can you imagine this? God gets excited over his children being saved. Because despite what many people say, God is a loving God. He doesn't send people to Hell. We because of our own sins and actions are paving our own ways there. But God, who is full of mercy and grace, sent Jesus to save us when we did not deserve it, even a little bit. And when a person accepts that gift of salvation through Jesus that God has given to them, He rejoices! He exults! He calms or quiets and He sings! Anytime, you are feeling lonely or depressed. If you're feeling unloved and sad, remember that if you are a child of God, He is with you, first of all- you aren't alone. He loves you, secondly and quiets your worried heart and mind. He is rejoicing over you, He knows you, He thinks about you. He is elated over you with jubilation and sings a song over you. You are a treasure and you fill Heaven with joy. So now, in light of all of this, we should be filling the earth with joy as well!